Stephan Baer spent years travelling all over the world, aquiring and learning to play hundreds of different percussion instruments and adding them to his extensive collection. His ability to play these instruments are superlative. Adding more melodies and vocals to his densley percussive mix really sets Baer's work apart from many percussion masters. His previous album, Across Distant Lands, took us on a trip around the world of percussive styles, and it remains one of my favorites, especially for dancing. Now with The Dark Frontier, Baer concentrates on the voices and rhythms of Africa. Both male and female African voices can be heard sweetly singing and chanting throughout this terrific record. In addition to marimbas, kalimbas, balafons, and dozens of additional percussion instruments, Baer adds synthesizers, flutes, and more, to give The Dark Frontier a deliciously exotic flavor. The drumming, as you may imagine if you've had the good fortune to hear Across Distant Lands, is superb.The voices ring out joyfully, giving this already exciting music an uplifting aura of celebration. The 10 tracks on The Dark Frontier, a little more than 50 minutes of music, are all first rate. There is no filler here. The hypnotic, seductive rhythms are irresistible. They almost insist that you get up and dance. I want to empaszie, though, these rhythms are organic and down to earth, as opposed to the revved-up dance music that I also love. The acoustic percussion, not the synthsizers, dominates. My favorite tracks include "The Confrontation," with a compelling, infectious beat driving an ambient melody as call- and-response voices add their power.The opening track, "Spirit of Aisha," has warm keyboards and a female voice, the percussion only gradually building as male voices join in. It's a most happy track! And the singing on "The Ceremony" is perhaps the most celebratory of this excellent album.Consider a display with an African theme and include Baer's Across Distant Lands to spark customer interest and sales. Stephan has the talent and technical ability to give the title concept beautiful form. The music is a passionate travelogue of musical styles and influences from various cultures with a strong African influence on most of the vocals. Baer does a wonderful job of fusing diverse elements into a style that is at once eclectic and yet unified by a sense of passion and playfullness. There are many mood changes both within and between the compositions. Good examples of this phenomena are "Sacred River" and "Nemo's Island". The vocals by Christine Azumah, Monique Berry, and Jim McGrath are superb. McGrath's intuitive percussion mauntains the tribal atmosphere throughout the discs ten tracks. This is a well thought out collection of compositions based on mood, sensibility, form, and melodic structure, with a rich canvas of ethnic timbres. The overall effect is a spellbinding music, often evocative of Ladysmith, and other great African vocal ensembles. It will appeal to a surprising variety of tastes. No liner notes to help with the interpretation of this album, but the graphics and titles suggest a voyage into the the abyss of "Darkest Africa". Stephan Baer is composer and plays keyboards and drums; joining him is percussionist extraordinaire Jim McGrath, who also shares chanting duties with Christine Azumah and Monique Berry. Baer's concoction of djembes, rattles, rainsticks, and log drums with African incantations and group singing is shaped by skillful use of keyboards. These cuts are not just contemporary electro-tribal dance jams; Baer floats us around bends of an inky river of secret rituals. He builds the intensity, then leaves us in in an eerie clearing of silence. What will the next sound bring? "Mawalo's Death" paints a paradise with warm and percolating gamelan, panpipes, and plucked harp. "Black Lagoon" follows; men huff a chant to a cadence suggesting a stomped line dance. My every fiber wants to dance too, but am I in over my head? I suppose the early explorers had such reservations; Are they dancing to honor us? Or to prepare us for dinner? "Mwari" (initiation), with its rattles and heavy breathing, semms like a sonic trip through a dragon's digestive system. the album ends with a brief but chilling sendoff, but to where? The Dark Frontier is incredibly engaging; let your imagination have an outing. 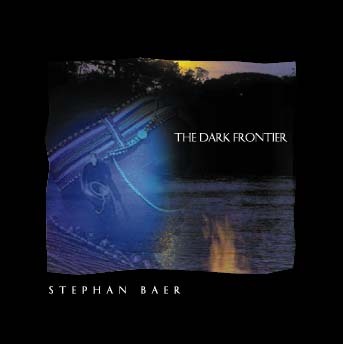 Stephan Baer's second release is called "The Dark Frontier," and is every bit as good as his previous "Across Distant Lands," also released on Talking Drum. Focused on the continent of Africa,the irresistible power of the drums call the listener to celebrate and travel on a sonic sojourn. Sophisticated compositions of extraordinary drumming and percussion provide a deep, rich and earthy backdrop for African singing and chanting. Flutes, marimbas, kalimbas, balafons and synthesizers sweeten the rhythmic layers with enchanting melodies. A dark feeling hovers over the deeper grooves & worldly rhythms, which can be traced directly to the Arican continent. Jim McGrath and Stephan Baer are both accomplished percussionists, relying on a variety of ethnic instruments to express thier ideas. Baer's disc is informed by African rhythms and styles,while McGrath's ranges more widely, including Latin and Asian elements, as well as sounds of nature in his composititons. If you like the voice of the drum or are just looking for some well-crafted original music, both of these discs will appeal to you.